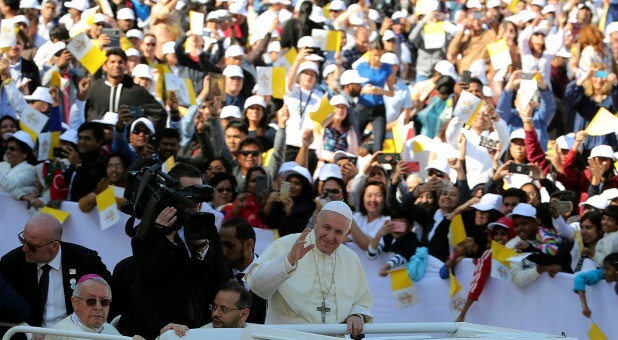 Catholics from about 100 nations were expected to attend the Mass, along with about 4,000 Muslims, including government officials, organisers said. We should not be surprised as the pope has said many times that all major religions are meeting God in different ways – apostasy of the first order. Jesus said, “I am the way the truth and the life. No one comes to the Father except through Me” John 14:6. The pope, who arrived on Sunday at the invitation of Abu Dhabi’s crown prince, has used the visit to condemn regional wars, including that in Yemen, and to call for greater cooperation between Christians and Muslims. Newspapers in Saudi Arabia, where churches are banned, ran pictures of Francis’ meetings with the grand imam of Egypt’s Al-Azhar mosque in Abu Dhabi on Monday and Abu Dhabi’s crown prince and Dubai’s ruler. The Pope entered the stadium in a white open top jeep to roars from the crowd. People wearing white baseball caps emblazoned with the visit logo packed the stadium stands and snapped pictures on their smartphones. The Mass was “a moment of divinity that will stay with me forever,” said Josephine Periera, a 68-year-old retired teacher who had travelled from the Indian Ocean nation of Sri Lanka to attend. As I have said before this pope could well be the False Prophet the Bible prophesies in the “last days” who will lead millions astray. What is unfolding also fits with an Islamic Antichrist that the False Prophet teams up with; expect him to emerge speaking PEACE. COULD THE VATICAN BELIEVE IN ALIENS? 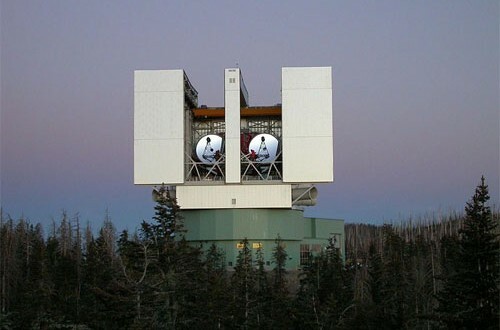 The Vatican Observatory Research Group (VORG) operates the 1.8m Alice P. Lennon Telescope with its Thomas J. Bannan Astrophysics Facility, known together as the Vatican Advanced Technology Telescope (VATT), at the Mount Graham International Observatory (MGIO) in southeastern Arizona where sky conditions are among the best in the world and certainly the Continental United States. According to EcumenicalNews.com, authors of a new book assert that Vatican astronomers are using both the VATT and the LBT’s LUCIFER instrument to watch for an alien saviour. Tom Horn and Chris Putnam, authors of Exo-Vaticana: Petrus Romanus, Project LUCIFER, and the Vatican’s astonishing plan for the arrival of an alien saviour, visited with the Jesuit astronomers at the VATT, including Guy Consolmagno. Guy Consolmagno speaks regularly about science and religion. In a 2010 interview, he told The Guardian, “Any entity – no matter how many tentacles it has – has a soul.” He made headlines because of this interview, in which he said he would offer to baptise an extraterrestrial being if one requested. Consolmagno has also stated that the Pope and the Vatican are keen on science, and they are kept up-to-date on the latest scientific developments by the Pontifical Academy of Sciences. On April 1, Tom Horn and Chris Putnam appeared on the show of American Messianic Jew Sid Roth, where Putnam revealed what they have uncovered in their research. “They have a whole theology developed around what they call the Principle of Plentitude, meaning anything God could do he would do,” said Putnam. Listen and be astounded by their findings. From Islamic traditions and Muslim scholars, the Mahdi (12th Imam), like the Antichrist is prophesied to be a political and military world leader unparalleled throughout world history. The Mahdi is said to “fight against the forces of evil, lead a world revolution and set up a new world order based on righteousness, justice and virtue”. At this time, according to Islamic tradition, the Mahdi is said to preside over the entire earth as the final Islamic Caliph. Clearly then, we see that the Antichrist and the Mahdi are both described as being political and military leaders the likes of which the world has never before seen. They are both viewed as being supreme religious leaders as well. Muslims believe the appearance of the Mahdi is imminent and many Bible prophesy teachers are watching expectantly for the Antichrist to emerge. Could they be one and the same person. After examining the Antichrist’s role as a universal religious leader, many Bible prophesy teachers have talked about the coming of the “One World Religion” or the false church which the Antichrist will both create and enforce upon the entire earth. A priest in the south of Italy enraged parishioners by dressing the Virgin Mary in a Muslim burqa for his church’s Christmas Nativity scene. These interfaith initiatives are based on the gradual elimination of the Western-Christian heritage in favour of Islam. The Catholic clergy is probably disoriented by Pope Francis himself; he was the first to allow the reading of Islamic prayers and Koran readings from the Vatican. The Pope has embraced religious relativism when it comes to Islam. He repeated that Islamist violence is the work of “a small group of fundamentalists” who, according to him, have nothing to do with Islam. For the first time in more than 700 years, Islamic songs resonated in Florence’s Cathedral, the Church Santa Maria del Fiore. Under the famous Dome of Brunelleschi, Islamic melodies accompanied Christian ones. The “interfaith initiative” was promoted a week after the barbaric massacre by Islamist terrorists in Paris at the magazine Charlie Hebdo, and included “Koran is Justice” and other such “hymns”. Church of England Bishop Harries suggested that Prince Charles’s coronation service should be opened with a Koran reading. In the US, more than 50 churches, including the Washington National Cathedral, hold Koran readings. Can you imagine Imams allowing the reading of the Christian liturgy in mosques? Surely, this is clear evidence we are in the “last days” and the prophesied falling away in the church is already happening. We are living in the days of the Great Apostasy spoken of in Matthew 24, Mark 13 and Luke 21.